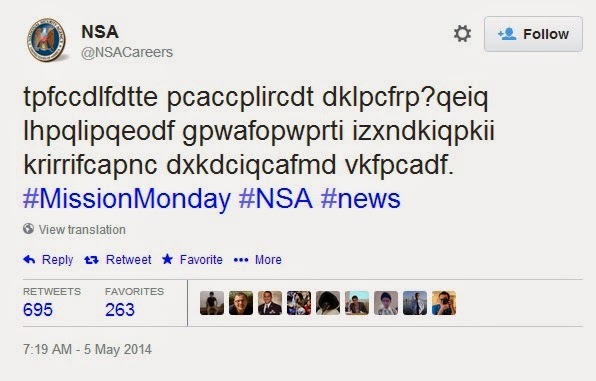 The National Security Agency (NSA) posted a cryptic tweet to Twitter on May 5, 2014, which had other users wondering if they had been hacked or if someone was playing a joke, but it turns out the tweet, shown below, was put out by the NSA as a recruitment tool. The code was cracked within minutes according to SkyNews, but the codes are expected to get harder. Did you crack it before reading the paragraph above? If so, the NSA may want you!